Below is a free downloadable, printable calendar. The calendars contain all major Australian public holidays as well as school holiday dates for all states. Statewide public holidays for all Australian states. School Holiday start and finish dates for all Australian states. Convenient A4 size so you can print at home or office. These calendars are A4 size and are perfect for home or office. You can stick them on the wall or the fridge. Click on one of the options below to download the calendars. After clicking the link above your calendar will either open automatically or download to the computer. 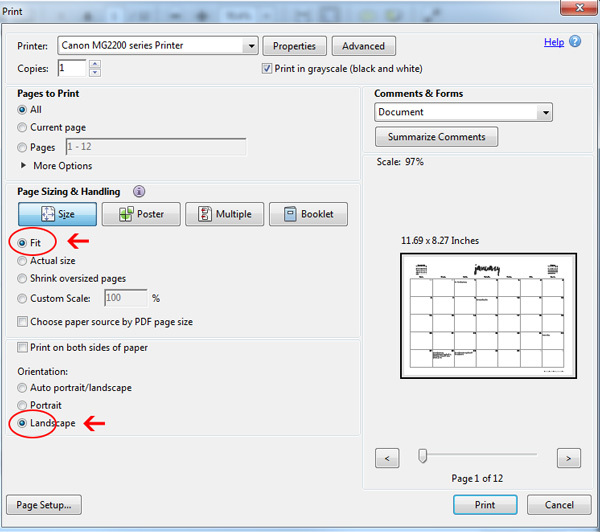 You will need to open the pdf file and select the Print option. 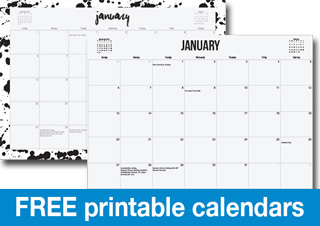 The calendar is built to fit perfectly on an A4 piece of paper with a landscape orientation (lengthways), however you may need to tweak your printer settings to get the best result. All printers and operating systems have slightly different ways of adjusting the settings. Many printers will default to portrait orientation so it's likely you will need to adjust print settings. If your printer has a print preview option then you can use that and experiment with the settings to get your calendar to fit correctly.